Red Bull Racing team principal Christian Horner has denied that Sebastian Vettel received favourable treatment in his quest to beat team mate Mark Webber to pole position at Silverstone. Red Bull has a new specification front wing at Silverstone, which was run by both drivers in Friday practice. In final practice on Saturday morning, however, Vettel's wing dropped forward on its mounting point and was damaged. 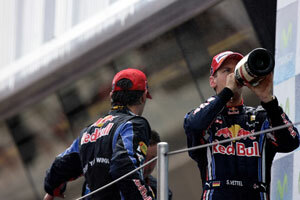 The team possessed only two and, ahead of qualifying, Webber's was removed and installed on Vettel's car. Horner said: "It's our job to do the best we can as a team and sometimes you have to make difficult decisions. It's the first time we have been in a position where we only have one component. Adrian Newey was very keen to run the wing; not necessarily because it was better but because it offered a new direction to look at. Therefore it came to me to make a difficult decision as to which car it went on. It went to Sebastian based on championship position, his performance in P3 and the drivers' feedback on the different front wings from yesterday." Webber, always quick at Silverstone, finished the opening practice day 0.64s quicker than Vettel but, in P3 on Saturday morning, the young German turned the tables by just 0.03s. Webber, stony-faced after qualifying second, said pointedly: "I think the team is happy with the result today..."
Coming just weeks after the coming-together between the Red Bull pair in the Turkish GP, the Silverstone incident was leapt on by the media as further evidence of a potential rift within the team. McLaren's Martin Whitmarsh, quizzed on the course of action he would have taken at McLaren faced with a similar decision involving Lewis Hamilton and Jenson Button, said: "I think if you are in a very strong position then there is even more cause to be as fair as you can with the drivers. I'm not going to comment on Red Bull's circumstances and it would be unfair to cast a view on that, but we try hard to give drivers the same equipment at the same time and I think that's important. "Both of our guys, we know, will do everything they can to race as hard as ever and if we expect that from them, then they should expect from us to be treated as fairly and openly as we can. And that's what we set out to try and do. "This weekend we were pushing hard to bring forward our new floor but, frankly, I had already decided that if there was only one, we wouldn't use it. I think the cohesiveness of the team is such that you don't need to set up those sorts of tensions and I think you can't really do that. If you are in a really strong position I think you have got to make sure that you hold it together."